This review has been a long time coming. Brunswick and Hunt is one of my new favorite restaurants in Seattle. The restaurant is owned by longtime Seattle restauranteurs and brothers, Barry Rogel and Scott Rogel. The name of the restaurant, located at 70th and 15th in Ballard, has a great story rich in history. When you enter the restaurant, you will notice the beautiful front bar to the right, made of American oak and birch. There is also an accompanying back bar in front of the kitchen. They were built near the end of the 1800's in Iowa by Brunswick Balke Collender and Company. In the early 1900's, the bars made their way to Winlock, Washington. That's where Barry and Scott found them. They had the bars moved to Seattle for a complete restoration. Opposite the front bar is a massive landscape painting by RJ Bocense titled, "The Hunt". As the story goes, The Hunt was painted as a companion piece for the "Brunswick", the front bar. The bar and painting have been together for over 100 years. The brothers had them both installed in their restored glory in the aptly named W.E. Hunt building in Ballard, and Brunswick and Hunt was born. Heavenly Brunswick fried chicken with slaw and potato salad. Brunswick and Hunt prepares fried chicken, one of my favorite foods, to perfection. 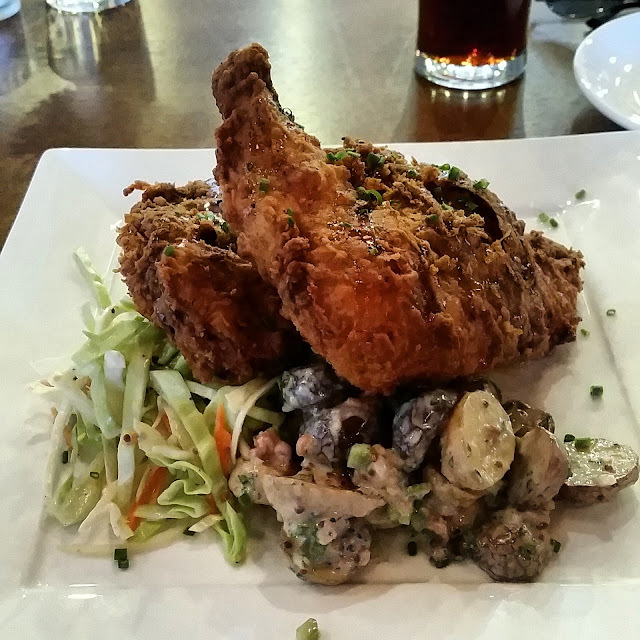 The portion is generous with a breast, the leg and thigh joint. The chicken was juicy with a crispy, golden brown skin that is drizzled with truffle-honey. I could have easily ordered another helping. It is accompanied by a delicious coleslaw and a purple potato salad. This ain't your Grandma's cornbread! My friends and I also ordered the corn bread with honey butter to share. 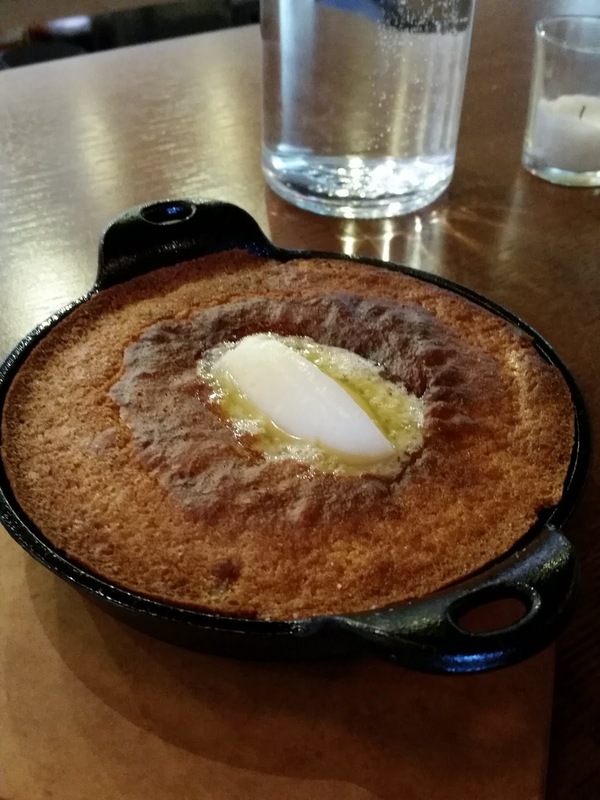 That is some seriously tasty corn bread. 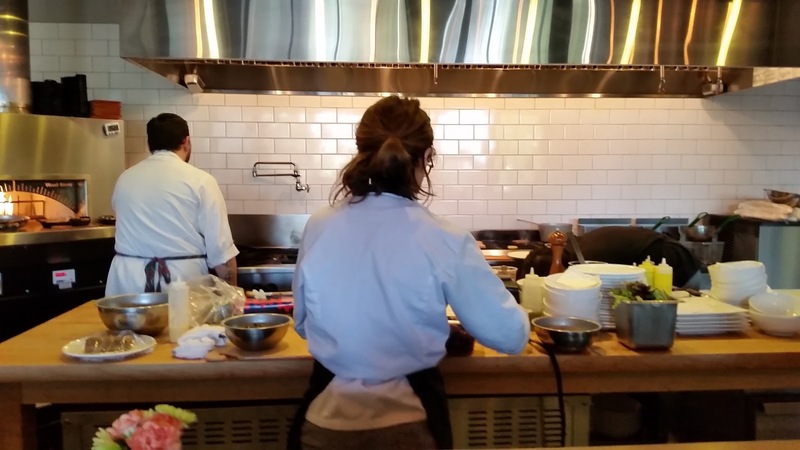 Open kitchen offers great views of food preparation. 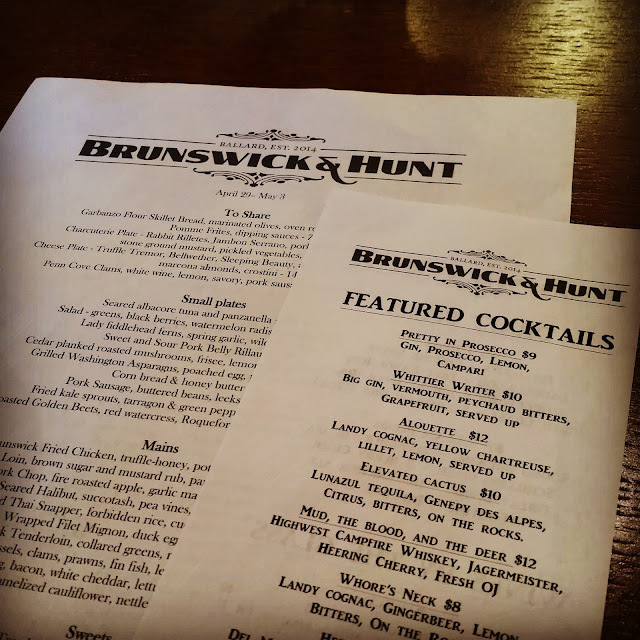 Brunswick and Hunt offers seating at the back bar that faces the kitchen. I love restaurants that allow you to watch the chefs in action. You get to witness all the fresh ingredients that are combined to create their delicious dishes. Not only is it entertaining, but you can learn a few things in the kitchen! Brunswick and Hunt delivers farm-to-neighborhood food, and they do it right. I'm looking forward to many more visits to try out all of their other tasty offerings!